A Glimpse Into My Reveries: This Is My Morning. Wednesday, June 29, 2011. This Is My Morning. Wednesday, June 29, 2011. I slept lightly last night for some reason, sleep seemed elusive. Something woke me just before 5:30 and the thought "I don't want to wake up yet" was quickly crowded by "What was that crash?". I knew it came from behind me, I was laying with my back to the window. I mentally reviewed if there was anything on the dresser that Brindle Blue may have tipped over as she jumped into the window to watch the morning birds at the feeders. Then, deciding it was too large a crashing noise to ignore, I rose to the window blind, twisting the stick to open it, peeked into the backyard. Finding nothing that seemed amiss I lay back down, determined to return to sleep. A few moments later, a large rustling and a flap of startled birds bid me return to the window. Upon closer inspection, I realized what had caused the crash. The gate-sized section of fencing, propped against the apple tree for staining, gave one of the neighborhood cats a perfect ladder access to the tree and, quite literally, the 'catbird seat' for the small seed feeder above the bird bath at the base of this small tree. The horror of my own accidental assistance to this marauding feline quickly turned to amusement as I watched the cat dangle from the tree by one foreleg as it tried, unsuccessfully, to regain his prime assassin position. Taking his empty jaws and chagrined expression at being laughed aloud at as proof of his failed attempt on my beloved birds, I realise his opportunity is lost. The crash I heard earlier was the fence falling away from the tree and hitting the raised bed before resting flat on the ground. That little problem was solved by it's fur-bearing instigator. I knew sleep wasn't returning, so I reached for something to read. As I read, propped up in bed, I enjoyed the occasional sound and the quick glimpses of hummingbirds at the window feeder. When the sound of one little visit seemed to last quite a bit longer than previous visits, I glanced up to find the hummer peering in my window. At first I thought it must be sipping at the flowers in the window box, but he was deliberately dancing back and forth above the flowers to get my attention. When I sat up for a better view, it flew the short distance from window screen to feeder and back, twice, to alert me that the feeder was empty! Fortunately, I had made up the sugar water the evening before, so I donned my robe against the morning drizzle and dashed outside to fill the feeder. My efforts have been rewarded with over an hour of bird watching as my jeweled visitor enjoyed his breakfast and jealously guarded it against the other hummers that frequent the garden. Now, as I have given up on the idea of sleep and am typing on my laptop, my Brindle Blue tries to squeeze under my arm as she purrs her love and promise of devotion, if I would only rise now and serve her breakfast. Falsely accused, if only mentally, of causing my reluctant departure from sleep, she is willing to forgive and forget, if I would now. rise. and. serve. breakfast! I hear my daughter's alarm chime from the room across the hall and I am enjoying the sound knowing that soon, I will no longer hear her morning routines. All too soon, the room now-makeshift bedroom with sewing paraphernalia shoved aside-will return to it's status of sewing room/guest bedroom as she has accepted a new Au-pair position and will be fleeing the nest. Coffee beckons. A rainy morning. It's been a good two weeks since I've been forced indoors by rain. It'll be a good morning to devote to kitchen time. I have strawberries to slice, rhubarb to chop and chickens to ready for the freezer, vacuuming to ignore, coffee to drink and several back issues of Mary Janes Farm to devour. This is my morning, Wednesday, June 29, 2011. 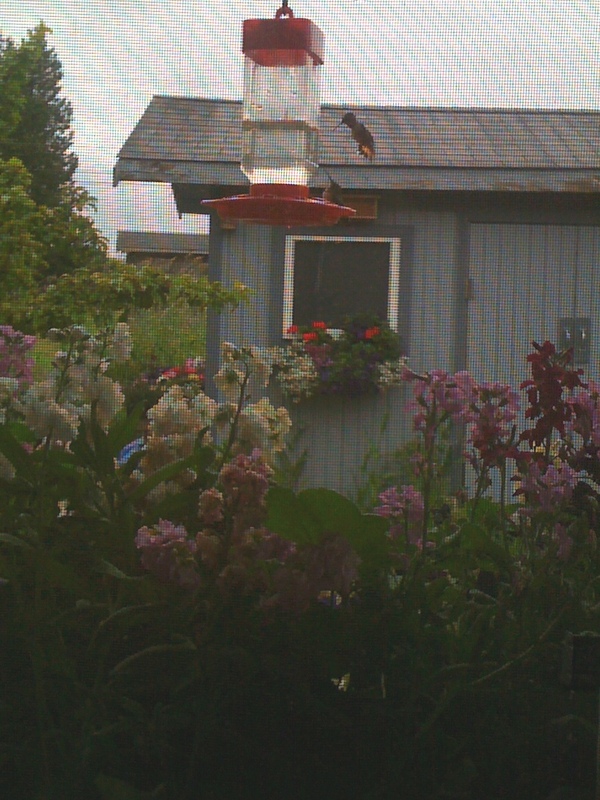 A pair of hummingbirds can be glimpsed out the bedroom window, past the clove-scented Stock blossoms in the window box. In the background can be seen one of the pair of window boxes on the shed, with my Mason Bee Houses above. Branching in from the left of the photo is the site of this morning's near-cat-astrophy. Ha, ha, ha, ha, ha...I would have loved to have seen that cat dangling with you laughing at it! Last evening Boo was helping me level out bark chips in my garden corner and she kept dancing too close to the finch feeder. The female would sit at the top of the hibiscus tree and "peeeeeeep!" letting me know she needed to hold still. As soon as she did, she and her young one flew down and ate...keeping an eye on Boo and making sure she didn't dance too close to the feeder. It's so funny how they interact with us in our gardens...I'm amazed at the way they communicate with us! It is wonderful! I get such joy from the birds. Well worth putting up with rain for the 30 minute serenade! It's Been A Great Staycation!